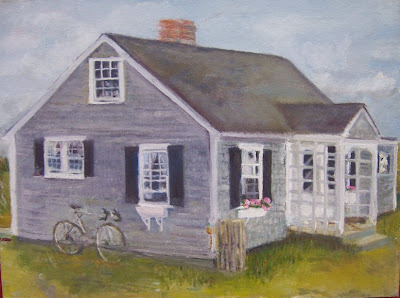 During the seventies my family enjoyed summers on Cape Cod. The July month was spent at the house of a dear family friend; H.P.Bagley II. My children were young and played on the beach in East Dennis, next to Sesuit harbor. This gave me plenty of time to paint in the area. My son Coert remembered, during a recent telephone call, having to “lug that tote-bag and paintbox” all over the place…. My reply was that someone had to carry the stuff. 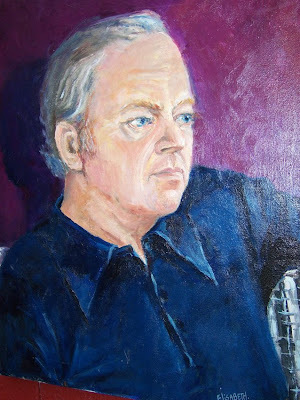 This portrait is of Prescott Bagley (Jan. 1927- April 2005) painted in '75-76. Below cottage is where Peter and I spent our honeymoon in 1964. This painting must also be from 1975 or 76. 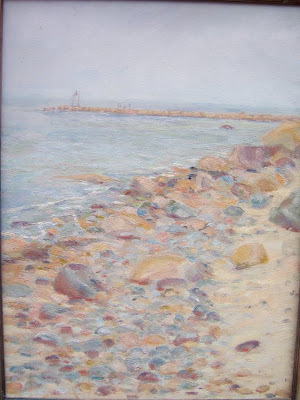 Here a painting over the beach towards the jetty at Sesuit Harbor. Seeing these paintings again (and there are some more to come) remind me of how much I was very influenced by my teacher at the time, Robert Hunter. He taught me to paint with thin layers. The "van Gogh" in me came out later. 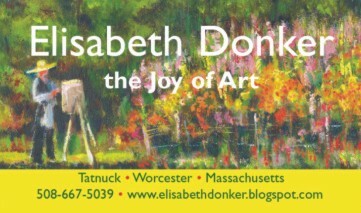 Coert mapped the above paintings on his Panoramio site. Have a look there (be sure to zoom in) to see how, in some cases, the world has changed.